This pattern is designed by Laura Kramer Doyle and is in leaftet number 408 published by Sudberry House. 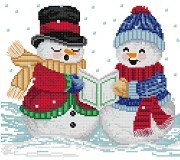 This pattern displays five snowmen braving the col singing carols. This pattern includes Full stitches, 3/4 Stitches and Backstitching. With Supplies: $22.96 You download the design. We will send you, 22 skeins of DMC Floss & DMC 18ct. 14x18" Aida, (White) to complete your project.